We’re made up to have been awarded Silver for our Elderflower Cider at the British Cider Championships! This is Europe’s biggest and most prestigious cider competition, held annually at the Bath & West Show in Somerset. We knew the Elderflower was popular with our followers, now it’s been recognised as one of the best flavoured ciders around. With the first signs of Spring we bring you a new limited edition draught cider in 20 litre boxes. Turners Gold is a low abv (4%) cloudy apple cider, a blend of Kentish dessert and cooking apples, back-sweetened with the fresh juice of Cheerfull Gold apples. It’s totally juicy and yummy and bursting with flavour! Turners Gold is available now in 20 litre bag-in-boxes only. Our Apple Pie Cider (4%) is back in stock and available in bag-in-box and, for the first time, bottles. Flavoured with warming spices and sweetened with fresh-pressed apple juice, Apple Pie is the perfect cider to add some cheer as the nights draw in. It’s equally delicious cold or warmed up. Harvest is back! This year’s festival will be on Saturday 10 September at the same location on Loddington Farm, Linton. Same drill as last year: live bands all day and evening, lots of great food, fun for the kids, and a well stocked bar with cider (of course! ), local real ale, wines and gin. We’ve also got plans to make it bigger and better. The Party Barn, our main stage, will be back. But we plan to make more of the second acoustic tent which worked so well. And we’ll have camping available for the Saturday night. 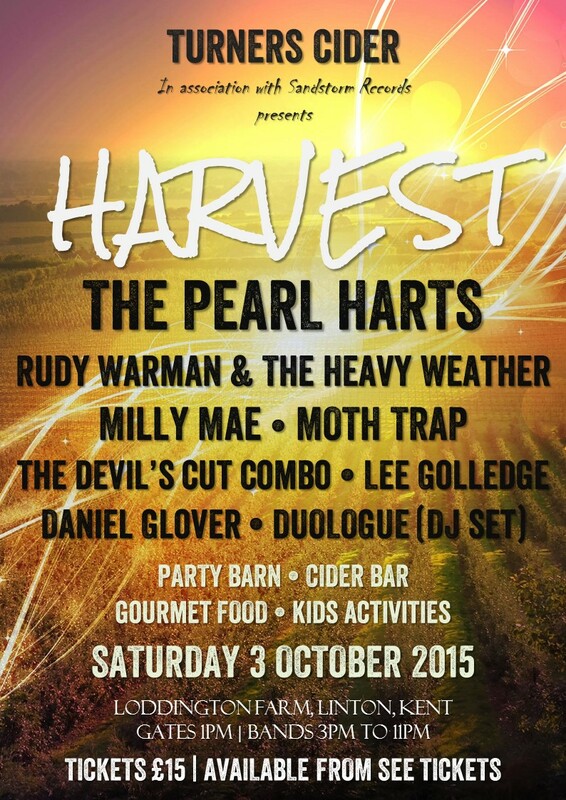 So keep up to date with all the latest festival news on the Harvest 2016 website or on the Turners Cider Facebook and Twitter pages. In the meantime, get your tickets! In my car there’s a dog-eared copy of Alastair Sawday’s Pubs & Inns of England and Wales. It’s like my Bible, only with more booze and less violence. For more than 10 years it’s made travelling around the country a joy rather than a chore. For, whenever we get hungry or thirsty, instead of stopping at the nearest service station, we look up the nearest “Sawday pub” and leave the motorway for the country lanes in search of it. Although my edition is getting a bit dated, it never fails to produce a decent pint, a good lunch and usually a picturesque village or two that we would have otherwise sped past. To which the answer is usually “great journey, I’ve no idea. We found this great pub…” If we were counting the hours I guess the answer would be “all day”. I’m about to embark on a journey round Kent and the south-east visiting a bunch of hand-picked pubs to sell our cider. How long will it take? The rest of my life, probably. Hopefully. We could have got someone else to do it. A distributor or a delivery guy. But where would be the joy in that? We’re going to do it ourselves, and take in the best pubs in the world along the way.